Maps and scenes can both use illumination to achieve different effects. Maps use illumination mainly to make maps look more three-dimensional—for example, by applying shaded relief or hillshades—but every scene needs a light source to illuminate it. You can configure this light source to achieve different effects within the scene. For 3D faces, such as multipatches or extruded polygons, sun lighting applies shading to the surfaces of the 3D shape. In addition, you can apply atmospheric effects, which allow you to simulate real-world lighting. For example, if you want to show sunset in your scene, you can use atmospheric effects to have a realistic ambience. Depending on whether you are working in a global or local scene, you have different options to define illumination. 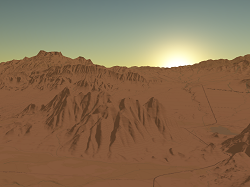 In a global view, you can set the location of the sun, thereby using light and shading to add more realism to the time of day being displayed. You can choose to show stars beyond the globe as well as an atmospheric halo. In the Contents pane, right-click a map, and click Properties to open the Map Properties dialog box. Check Show atmospheric effects to simulate a specific mood, such as sunset. Check Show stars and halo to show stars beyond the edge of the globe and an atmospheric halo around the globe. Check Display shadows in 3D to simulate shadows in the scene. Depending on the light source, 3D features such as multipatches or extruded polygons can have shadows. Keep in mind that simulating shadows can impact drawing performance. Set Light contribution to define the brightness of the scene. Light contribution is not available if Show atmospheric effects is checked. In that case, the light is simulated depending on the position of the sun. By specifying Noon at camera position, where ambient light is equal regardless of where on the globe the camera is positioned. By Date and time, including the time zone. By the Absolute sun position, specified by latitude and longitude. By the Map time, which is only available if a map time is set for the scene. In local scenes, only spot lighting is available. You can set the azimuth and altitude of the light source, as well as the amount of contrast, used in rendering the illumination of the scene. The illumination properties for a scene apply shading to all areal features, including 3D faces and surface data. Turn on shading if you want to show shadows for 3D features. The azimuth is the angular direction of the sun, measured from north in clockwise degrees from 0 to 360. An azimuth of 90º is east. The default azimuth is 315º (NW). Default sun azimuth (direction) for hillshade is 315º. The altitude is the slope or angle of the illumination source above the horizon. The units are in degrees, from 0 (on the horizon) to 90 (overhead). The default is 45 degrees. 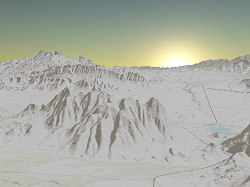 Default sun altitude for hillshade is 45º. The contrast controls the amount of shading applied to a surface. No contrast is 0 on the contrast scale, and 100 is the highest contrast. You may want to change the illumination angle when applying a shaded relief or hillshade to a digital elevation model (DEM). Optionally, you can adjust the contrast of the hillshading. Click Restore Default to reset your changes to the default illumination values.